孙朝虎, 白志毅, 李清清, 彭建庆, 李家乐. 三角帆蚌生长和壳色性状早期复合选择的优化研究[J]. 渔业科学进展, 2019, 40(2): 91-97. DOI: 10.19663/j.issn2095-9869.20180201001. SUN Chaohu, BAI Zhiyi, LI Qingqing, PENG Jianqing, LI Jiale. The Optimization of Early Compound Selection for Growth Traits and Shell Color in Hyriopsis cumingii[J]. Progress in Fishery Sciences, 2019, 40(2): 91-97. DOI: 10.19663/j.issn2095-9869.20180201001. Corresponding author: BAI Zhiyi, E-mail: zybai@shou.edu.cn. Abstract: At the early stage, the shell of the strain F1 of "Shenzi No.1" Hyriopsis cumingii is transparent, so the workload involved in selection and improving the breeding efficiency can be reduced at this stage. In this study, seven different selection methods were tested with different selection orders and retention rates of objective traits. When shell length (SL) was the first trait selected and a deep purple shell (PN) was the secondarily selected trait, the different methods used were SL 50% × PN 20%, SL 30% × PN 33%, and SL 20% × PN 50%. However, when the selection order was the opposite of this, the selection methods used were PN50% × SL 20%, PN 30% × SL 33%, and PN 20% × SL 50%. Moreover, according to conventional experience, juveniles with a deep purple shell and large size were selected simultaneously in a seventh control gorup. This was done to compare the experimental results of this control group with those of the other six methods. The total retention rate of each method was 10%. 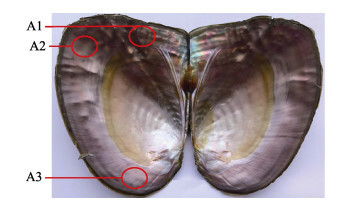 After five months of culture, the growth traits (shell length, shell height, shell width, body weight, mantle weight, and shell weight) and the inner shell color parameters (L, a, b, and dE) of the selected mussels were measured to evaluate the early selection effects of these seven methods. The results showed that the different selection methods led to differences in the effects of early selection. The growth traits of individuals selected by the PN 50% × SL 20% and PN 20% × SL 50% methods were the best, while the selection effect of the SL 30% × PN 33% method was the worst. However, when the deep purple shell was selected as the objective trait, the other three methods (SL 50% × PN 20%, SL 30% × PN 33% and SL 20% × PN 50%) were better than the above methods. 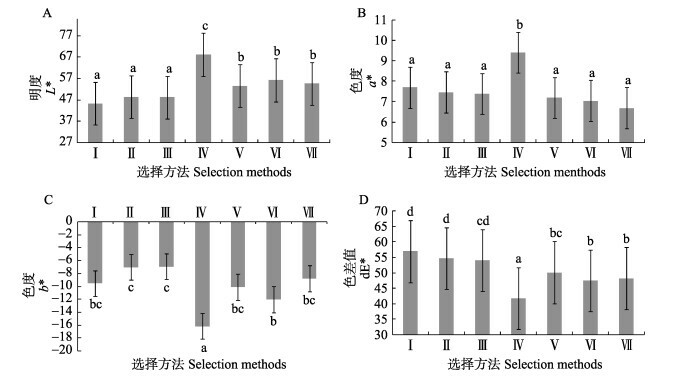 The selection effect of the SL30% × PN 33% method was the worst for the growth traits. The traits of H. cumingii selected by the traditional method were not prominent in any of the experimental groups. The method of taking SL as the first selection trait was SL × PN, while the method of taking PN as the first selection trait was PN × SL. In the early stage, the SL × PN method can be used to select for clams with a deep purple shell color, while the PN × SL method can be used to select for larger clams. The results showed that the selection order had a significant impact on the selection effect. In addition, when the traits with higher expectations were selected at the end, the effect of the selection was better. Further more, both the retention rate and the compound selection response affected the selection effect.